This is the Phono Transfer System based on the Flat Phono Preamp and RIAA EQ/Monitor Switcher project published in the Pro Audio Design Forum. The Phono Transfer System is designed for the multi-tasking LP archivist, mastering facility, record manufacturing or any professional application requiring high quality, low-noise, no-nonsense Flat or RIAA deemphasized playback. The Phono Transfer System consists of a flat, non-equalized, balanced input, balanced output phono cartridge interface and a dual path RIAA Equalizer/Monitor Switcher with two independent stereo line level inputs and two stereo outputs. When used together, the two boards are a complete turntable playback and workstation monitoring solution permitting simultaneous recording and playback. The flexibility of the Phono Transfer System permits doubling transfer workflow. Numerous other configurations are available ranging from simple equalized playback, lathe calibration, disc cutting and record manufacturing quality assurance making the Phono Transfer System a "Swiss Army knife" multi-purpose tool. The Flat Phono Preamp board is a fully balanced instrumentation amp designed specifically for direct coupling to moving magnet phono cartridges or moving coil carts using external transformers. The fully-differential input connections are jumper-selectable for either balanced (floating) tonearm wiring using shielded twisted pair cables or unbalanced grounded RCA coaxial interconnect. Highest hum rejection is realized when the input connections are fully-balanced. Using either input configuration common mode rejection is realized on-board using a pair of high-accuracy THAT1240 line receivers in a "double-balanced" cross-coupled output. The RIAA EQ/Monitor Switcher was designed ground-up to permit flat recording to assist de-clicking and noise removal during LP restoration and provide flat archival copies. When flat recordings are transferred, monitored and de-clicked, it's often desirable to hear them with RIAA EQ applied. For the final product, some form of playback equalization is needed whether its applied in analog or DSP-based. Not every situation requires flat transfers. For this reason the EQ Monitor Switcher was built with extreme flexibility to enable both EQ'd and Flat record and monitoring workflows. The RIAA EQ/Monitor Switcher was also designed to permit simultaneous recording and playback to speed transfer workflow. While it's always desirable to confidence monitor recordings during ingest, continuous monitoring is not always necessary. Transferring an LP album side provides up to twenty minutes of opportunity for additional tasks such as trimming or declicking previously recorded cuts and countless other tasks requiring playback non-destructive to the record transfer path. The design goal was to provide a record path from turntable to workstation A/D independent from workstation playback. Through the use of on-board monitor switching only one amplifier input is required to listen to turntable or workstation both with and without EQ applied all while recording uninterrupted audio. Not all applications need the amount of flexibility offered by the Phono Transfer System. Some uses and workflows may need more, others less. To provide a truly flexible "Swiss Army knife," a rich assortment of jumpers, signal inserts and level trims are provided on the RIAA EQ/Monitor Switcher to assist mastering facilities in both playback calibration and cutting and restoration operations needing EQ curves other than RIAA. Flat playback and RIAA EQ level are adjustable by trim pot (-∞ to +14 dB) or jumpers for precise -3, 0, +3 dB steps. Numerous jumpers permit inserting external signal processing such as cartridge correction filters and alternative playback EQ at various circuit points. For custom builds, the jumpers and trim pots are designed to be connected to external front panel controls. The Phono Transfer System RIAA equalizer section uses an active inverting topology first published in 1981 by John Roberts and later used by Solid State Music in the SSM2015 application note. The Roberts RIAA topology is unique based on where the inverting op amp input is connected to the RIAA network. The 3180 µs and 318 µs time constants are split into different arms of the EQ network. An "active/passive" 75 µs pole, followed by a 318 µs pre-emphasis are in the input arm. The final 3180 µs de-emphasis is in the negative feedback arm. By splitting the network, a very accurate RIAA playback curve is obtained with reduced 3180/318 µs component interaction. Two 1% Wima capacitors of identical 10 nF value and six 1% metal film resistors in each channel provide time constants with accurate design centers of 74.99, 318 and 3180 µs. Typical EQ accuracy is better than 0.2 dB from 100 - 20 kHz. Below 100 Hz, a separate gentle sub-sonic roll off is introduced at 8, 11 or 16 Hz depending on jumper selection. For the record cutting facility the RIAA EQ/Monitor Switcher can also be jumper-selected to provide line-level Inverse RIAA equalization for non-feedback and feedback cutting lathes. The Flat Preamp can also be used as a cutter head feedback coil amplifier. The RIAA EQ/Monitor Switcher has two balanced stereo inputs: Phono and Line. The Phono line-level input uses THA1240 unity-gain line receivers. The Line inputs use THAT1246 balanced inputs. The RIAA EQ/Monitor Switcher has two stereo pairs of THAT1646 OutSmarts® line drivers providing fully-balanced Record and Monitor Outputs. 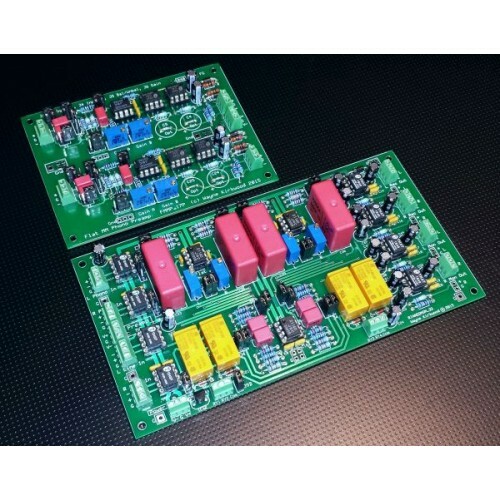 In addition to the balanced outputs, two auxiliary unbalanced stereo pairs are available for RCA connections or unbalanced instrumentation such as an oscilloscope, goniometer or level meter feed. The RIAA EQ/Monitor Switcher Phono input may be routed to the Record Output either with or without RIAA de-emphasis. The Line Input may be routed to the Monitor Output either with or without RIAA de-emphasis and to the Record output with RIAA de-emphasis. Back in stock! This is the bare PC board for the Flat Phono Preamp project published in the Pro..